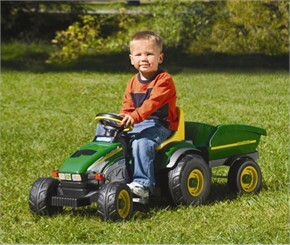 With this Peg Perego John Deere Ride On farm tractor with trailer your child can definitely haul anything around their work site! This indoor and outdoor pedal tractor features large adjustable seat and large tractor wheels, and best of all, it’s almost fully assembled! We have bicycle chain and sprockets to protect your children’s fingers and a cool matching trailer so they can carry their favorite toys around! The tractor weighs about 27 lbs and can be shipped via LTL, TL, or UPS. We offer 2 year extended warranty. Age 2 and up and the weight capacity is 55 lbs. Made in the USA in our Fort Wayne IN Factory using domestic and global components. Availability : This item takes two business days to leave the warehouse plus transit time. NOTE : Due to size this item ships via Ground ONLY. Express shipping is not available for this item and it does not ship to Alaska, Hawaii, PO Boxes, or APO Addresses.